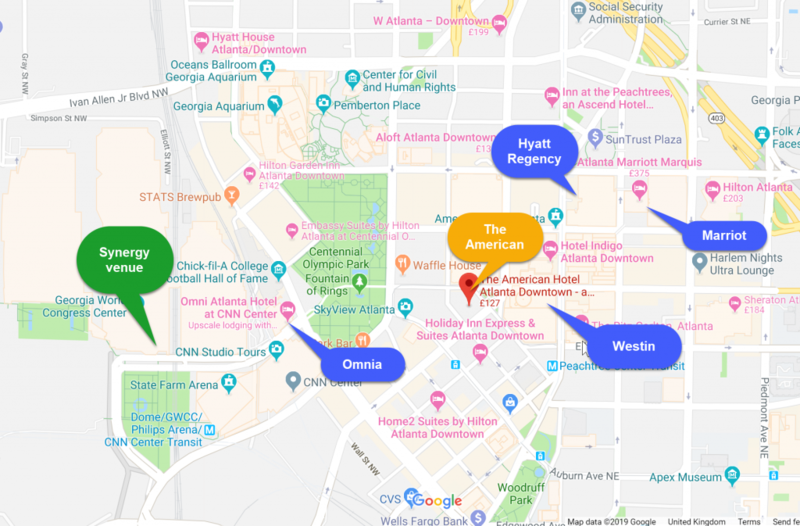 2019.02.24 – Some Atlanta attractions links added, plus the hotel group booking discount link. If none of the above apply to you, you can get 10% discount using my discount code “REFERRAL10%”. See the bottom of this post for how to add me as your referrer. Keep a note of your registration confirmation code. You’ll need this repeatedly to log into the website to book your labs and build your custom agenda. Rather annoyingly, the site still doesn’t allow you to choose your own password only the password for the mobile app. If you can’t expense your accommodation (or you are the one paying the expense bill!) then check out the money saving tips later in this post. Great for independent consultants or those with strict expense limits. If you want to take an instructor-led learning labs, you’ll need to pay an extra $99 as part of your conference registration. This gives you access to up to three labs which are all taking place on Sunday and Monday only. If you don’t want to shell out an additional $99, the self-paced labs are still be included in your conference fee and offer similar content, but without the access to the Citrix experts during the lab. Whether you are a Synergy newbie, or hardened veteran, there is new Path to Success feature that suggests sessions based on your role or industry vertical to help you get the most from the conference. Do check it out. One of the most popular (in the UK at least) is Revolut which allows you to open a virtual account in a number of different currencies on their app and only charges the interbank exchange rate at the time of the transaction to move money between them (from £ to $ for example). You can sign-up on their app and get an instant virtual card number, and then upgrade on the app if you want a physical credit card too. The cheapest (and greenest) way of getting from the airport to the venue hotels is by MARTA transit. Take the Red or Gold line from the airport and alight at Peachtree Center for most of the conference hotels. If you are going straight to the conference venue, or Omni Hotel, change at Five Points onto the Blue/Green line and alight at Omni station. Book a shared ride shuttle from the airport to your hotel. These are all $16.50 from ATL (regulated fare) although of course may take longer as they pick up and drop off at multiple locations, and you might have to wait for the shuttle to pick you up at the airport. Perhaps use social media or the CUGC community to see if anyone is arriving at the airport at around the same time as you (or even on the same flight) to arrange to cab-share. The conference hotels are not as expensive as previous conference locations, although the downside is that the World Congress Center and it’s surrounding conference hotels aren’t in the best of areas. As with previous years I’ve arranged a group booking discount with a good quality hotel that’s situated right in the center of the above conference hotels, so convenient for meeting colleagues who might be staying nearby. It’s actually ranked higher on TripAdvisor than all of the conference hotels! – Notable guest over the years have included Richard Nixon, Nelson Rockefeller, Elvis Pressley, James Brown and Dr. Martin Luther King Jr.
– A new open and welcoming arrival experience in the hotel’s lobby and public spaces. I’ve negotiated a very good guaranteed rate compared to the rack rates, plus anyone booking via my discount code will receive free breakfast (usually $20 per day) for up to two guests. I have rooms allocated from Saturday May 18th to Saturday May 25th for those coming earlier for TechEdge or labs or those staying a bit later. The rate is guaranteed and won’t increase nearer the conference and will be available until a month before Synergy or until my allocation is sold out. To book this special rate, use this link. Remember that hotel tax in Atlanta is about 18% with a mandatory state fee on top of $5 per night. Beware of hidden resort fees – these are becoming a popular “stealth tax” allowing hoteliers to charge more pre-night but keep their advertised rates low by splitting out the charge for internet, sport facilities etc into a daily “resort fee”. Georgia has a state-wide $5-per night room fee, so don’t confuse this with other hotel-levied resort fees. Whilst it’s tempting to just bring t-shirts and shorts, conference venues and break-out rooms always crank up the air-con so are really chilly when you are sitting for several hours doing a lab. Also, previous keynote’s have been known for being rather draughty! If you run or jog, why not see if other delegates want to join you on a morning run? Twitter is great for arranging these kind of things. Mobile power bank – you can spend long days out of your hotel so might need to top up your phone if you’re taking lots of photos and tweeting. The conference halls are large, and you’ll spend a fair amount of time on your feet. And walking. All the walking. Pack. Comfortable. Shoes. Arrange your airport/hotel transfer. Pre-book your shared shuttle ride if you’re using one (see section above). Download the Summit/Synergy mobile apps and download the Atlanta area in Google maps whilst on WiFi to avoid expensive roaming data charges if you need to search for your hotel or are using Google Maps as a GPS whilst driving. If you visit the US frequently, and you’re from one of the supported countries, consider applying for Global Entry. Since I applied three years ago, I’ve never had to queue at US immigration since. Well worth the modest fee and arranging the interview en route through ATL for your next visit. The online agenda builder does allow you to download a combined iCAL file containing all your chosen sessions. I’ve provided some alternate iCAL downloads below if you wish to import the entire session catalog into your favorite calendar service. Note even if you use my iCAL files you should still sign-up for the sessions you want to attend, either on the website or mobile app. The conference organisers use sign-up numbers to gauge session demand and ensure the allocated rooms are of suitable size. Also note that my iCAL files are a snap-shop in time (as of 15th April). If sessions get changed, or cancelled after that date, the change wont be reflected in the downloads. Purchase a Net10 or one of the many other PAYG SIMs available in WalMart or other local stores. If your hotel charges extra for breakfast – don’t pay! Breakfast and lunch is provided on every day of the conference, and there is food available at the Welcome Reception on Tuesday and party on Thursday. Wednesday is vendor dinners night when you might need to fend for yourself if you’re not lucky enough to be invited to a vendor dinner. My hotel deal above includes a daily breakfast in the room rate. Take one (or several) self-paced or instructor-led learning labs on a few products that you might not be so familiar with. If you see me around the conference venue, do say hi. I’d welcome any feedback you might have on this guide. If you have some free time either side of the conference, you can visit World of Coca Cola, The Aquarium, Zoo or The Mercedes Benz American Football Stadium. Atlanta has many cool neighborhoods you can explore via the MARTA. You can ride the Streetcar (or tram as most Europeans call them) around a loop for only $1 and see a bit of downtown. There is also a useful whatson guide for other cultural and sporting events. The Clermont Lounge is an Atlanta institution having had a string of famous clientele over the years!